I’ve received information that Albert C. Gray, who has been the President and Chief Executive Officer of the controversial accrediting body the Accrediting Council for Independent Colleges and Schools (ACICS), may be leaving that organization. UPDATE: 04-18-16 11:15 am: ACICS has issued a press release confirming that Gray has resigned — see below. Gray and ACICS board chair Lawrence Leak did not respond to requests for comment. Gray’s failed defenses of the troubled accreditor have made him an easy target for criticism, and based on ACICS’s record, it appears he deserves such criticism. 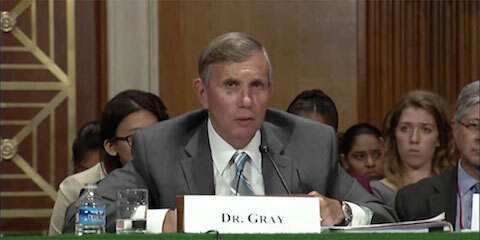 But if indeed Gray leaves ACICS, his departure is unlikely to end the inquiry into whether the U.S. Department of Education should keep recognizing ACICS as a guarantor of educational quality. And it shouldn’t end that inquiry. ACICS has been under fire in recent months, given that a number of the schools it was supposed to oversee, including the now-collapsed Corinthian Colleges, have been exposed as predatory companies that have left many students worse off than when they started. Accreditation by non-profit bodies like ACICS makes schools eligible to receive federal student grants and loans, and ACICS schools have been receiving billions annually in such aid. But many ACICS-approved schools, not just Corinthian, have poor track records — including those owned by predatory companies ITT Tech, Kaplan, EDMC (the Art Institutes), Career Education Corporation (Sanford-Brown), Alta Colleges (Westwood), Globe, FastTrain, and Daymar; all these companies have been under investigation by law enforcement for deceptive practices. The latest ACICS-accredited school to make news is Kansas-based Wright Career College, which late last week suddenly filed for bankruptcy and shut its campuses, leaving about 1,000 students in limbo. Student Veterans of America and Vietnam Veterans of America; and a coalition of 23 groups that advocate for students, consumers, and educators. ACICS told ProPublica last week that the coalition letter contained “misleading allegations” and that it was preparing a “comprehensive response” to the various criticisms. But given the terrible abuses of students by for-profit colleges that have occurred, it is clearly time, long past time, for the Department of Education to look critically at ACICS and the other national and regional accreditors of for-profit schools and to demand fundamental changes. The departure of one elder from this Potemkin Village changes nothing. Today, the ACICS Board of Directors announced a change in the top leadership of the agency. It has appointed Anthony S. Bieda, 63 of Alexandria, VA to serve as Executive in Charge. Simultaneously, the Board will initiate a search for a President & Chief Executive Officer. Bieda previously served as vice president of external affairs for ACICS since 2007. His experience in public and private higher education began more than 20 years ago, when he managed public affairs for the Arizona University system. He holds a Master’s of Business Administration from Regis University and served for several years in municipal county government in Oregon before joining ACICS. Bieda replaces Dr. Albert Gray, who resigned after more than seven years as President and CEO.